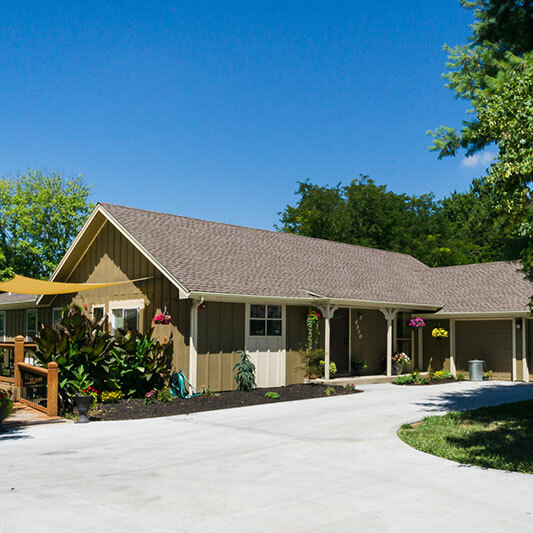 Clover Care Home, elderly long term care, has been providing excellent dementia and Alzheimer’s care options in the Kansas City area since 2013. Located in Shawnee, we are a locally owned and operated alternative care facility offering premier and specialized care. Clover Care Home enables seniors and their families’ peace of mind during the course of aging in a comfortable, home-like environment, embracing a full continuum of healthcare designed specifically for the needs of each resident. Our skilled staff works with residents helping them adapt to their surroundings in an unmatched person-centered elderly long term care facility for those with memory loss. Our activities program is designed to incorporate each resident’s physical and cognitive abilities, while encouraging a vibrant daily experience for each resident, providing care at every level so our residents can age in a place in the comfort of ‘home’. We built Clover Care Home for our own family, and we maintain the highest standard in everything we do for our senior residents and their families. We do all this because our goal is to provide the very best care for senior memory care residents. Our support staff is extremely skilled and trained in every aspect of their role at Clover Care Home. Our caregiving model allows us to be the best in the area when it comes to providing elderly long term care in the greater Kansas City metro. We continually strive to provide personalized care services to meet the needs of each and every individual at Clover Care Home, never losing sight of the fact that we have been entrusted with the lives of your loved ones, and we are committed to providing the best elderly long term care so your loved ones can live a dignified and respectful life. We embody the individual values of our elderly residents by attending to their physical, intellectual, social, emotional and spiritual needs and by offering a comprehensive continuum of care. We want our residents to experience the fullness of life in community with dignity, joy and the highest levels of independence their health will allow.